The walkway astronauts will use to board SpaceX’s Crew Dragon capsule before missions to the International Space Station was added to historic launch pad 39A on Monday. 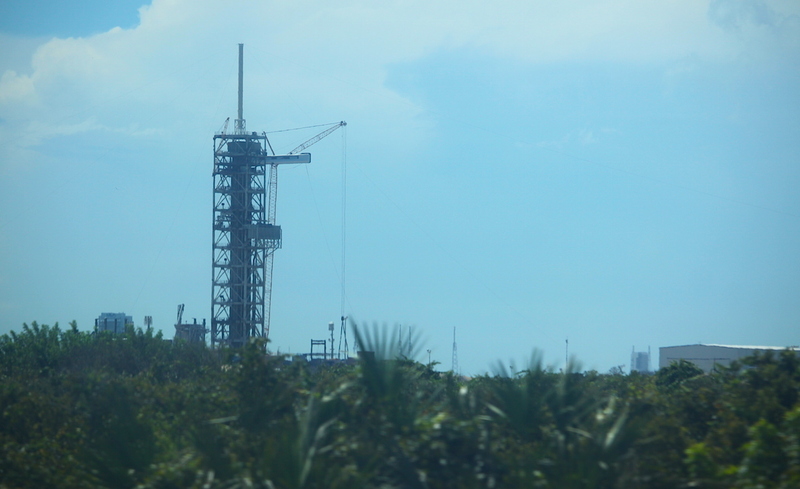 A crane erected at the seaside launch complex on Florida’s Space Coast raised the crew access arm off the ground around 9 a.m. EDT (1300 GMT) Monday and positioned the new appendage on the fixed service structure later in the morning. 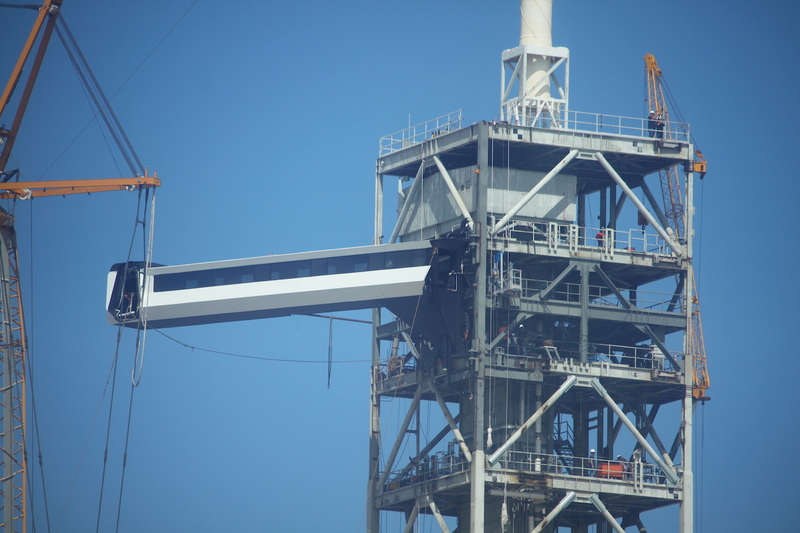 The attachment of the crew access arm is a major step in readying pad 39A at the Kennedy Space Center for launches of SpaceX Falcon 9 rockets with the company’s Crew Dragon spacecraft. SpaceX leased the launch facility, the former site of Saturn 5 and space shuttle blastoffs, from NASA in 2014. Ground crews modified pad 39A for satellite launches with the company’s Falcon 9 and Falcon Heavy rockets. SpaceX has launched 14 times from pad 39A since February 2017, including the debut test flight of the Falcon Heavy rocket earlier this year. 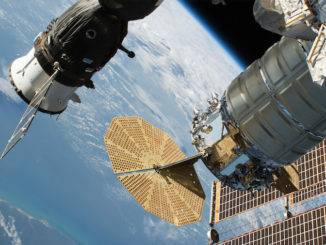 But the bulk of the company’s Florida-based missions have shifted to nearby pad 40 at neighboring Cape Canaveral Air Force Station, allowing workers to focus on preparing pad 39A for crewed missions. Before the Falcon rocket family moved in at pad 39A, the launch complex hosted 12 launches of NASA’s Apollo-era Saturn 5 moon rockets, including the Apollo 11 lunar landing mission. NASA’s space shuttles took off 82 times from pad 39A, a record that counts the shuttle program’s first and final flights in 1981 and 2011. Demolition teams took apart the shuttle-era rotating service structure at pad 39A piece-by-piece over the last couple of years, leaving the pad’s fixed tower in place for the crew access arm. The Falcon 9’s assembly hangar was constructed over the crawlerway once used by Saturn 5 rockets and space shuttles moving to the launch pad, and SpaceX manufactured a new retractable structure that serves as a Falcon 9 transporter, erector and umbilical tower. 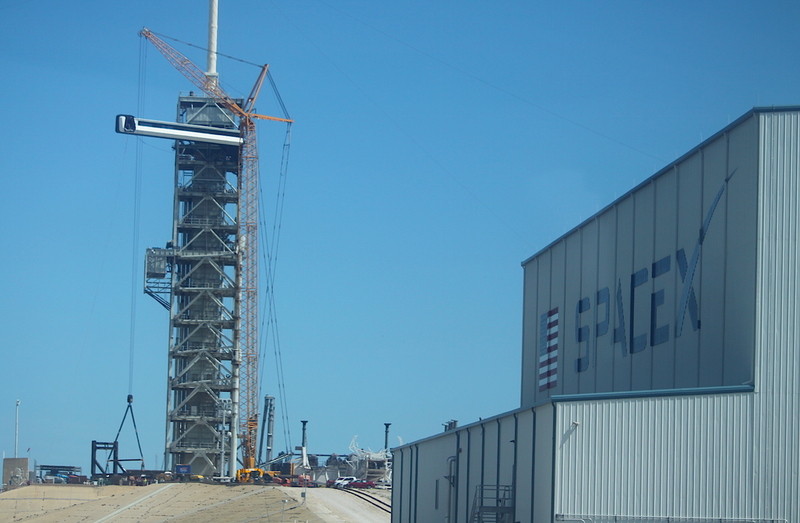 The Falcon 9 rocket is taller than the space shuttle, so SpaceX’s crew access arm was installed on the pad 39A tower at a higher level. The orbiter access arm extended to the shuttle’s hatch from the fixed structure’s 195-foot-level, where crews would walk into the arm’s white room for final suit-ups and boarding after riding an elevator from the base of the pad. 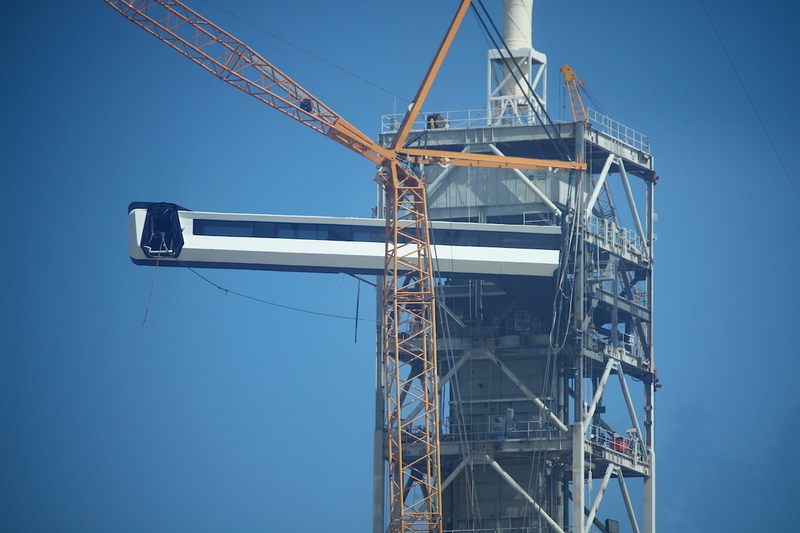 Workers configured a new floor and added an arm attach mechanism several stories higher on the launch pad tower for SpaceX’s Crew Dragon capsule. SpaceX aims to launch the first Crew Dragon spacecraft on a test flight to the space station as soon as November without astronauts on-board, followed by another test launch — again without a crew — in roughly March 2019 to test the capsule’s in-flight abort capability. If those tests go according to plan, SpaceX could be ready to launch a two-man team of NASA astronauts on a demonstration mission to the station in April of next year. NASA announced earlier this month that shuttle veterans Doug Hurley and Bob Behnken will fly on the first piloted Crew Dragon test flight. Once its test flights are complete, NASA plans to certify the Crew Dragon for regular crew rotation missions to the space station. NASA has a $2.6 billion contract with SpaceX to develop the Crew Dragon capsule. 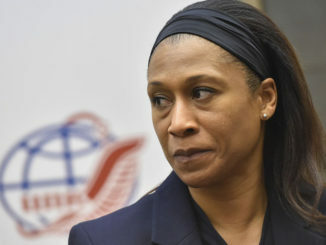 The space agency signed a similar $4.2 billion deal with Boeing for that company’s Starliner vehicle, giving NASA two commercial spaceships to carry astronauts into low Earth orbit and back, ending U.S. reliance on Russian Soyuz spacecraft for crew transportation. 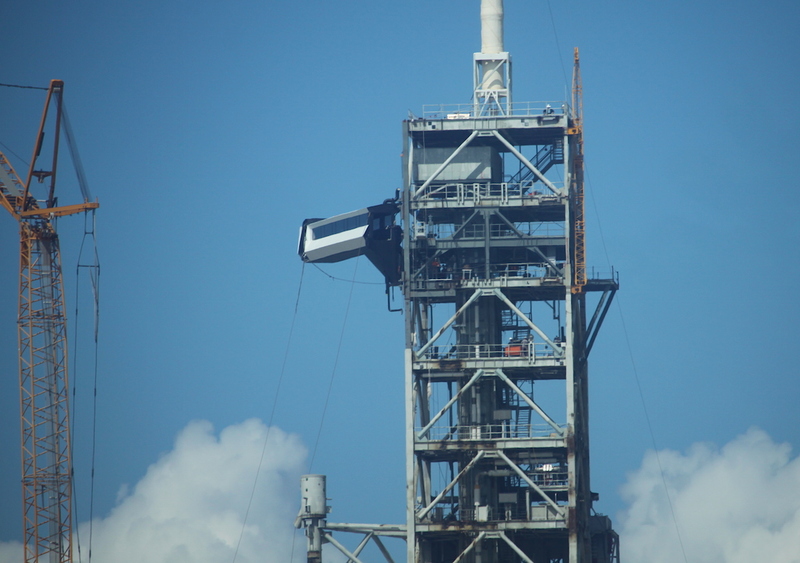 A crew access arm similar in function — but much different in appearance — has also been installed at United Launch Alliance’s nearby Atlas 5 launch pad at Cape Canaveral, where Boeing’s CST-100 Starliner commercial crew craft will lift off with astronauts on-board. 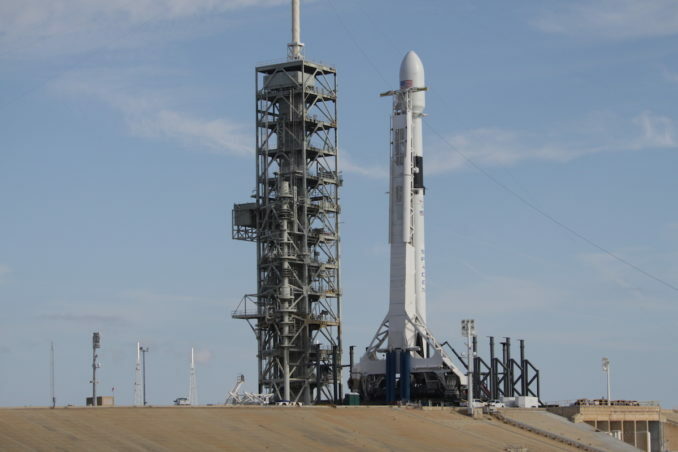 Other preparations planned by SpaceX at pad 39A include the addition of a slidewire escape system that would be used by astronauts and launch pad ground crews to quickly evacuate the facility in an emergency. Similar slidewires were used during the space shuttle program. 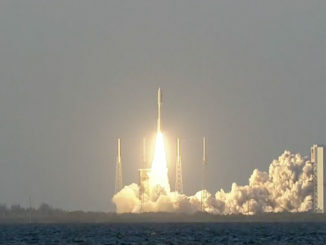 Boeing and ULA outfitted the Atlas 5’s launch pad with zip lines to whisk crews away from the rocket during an emergency. 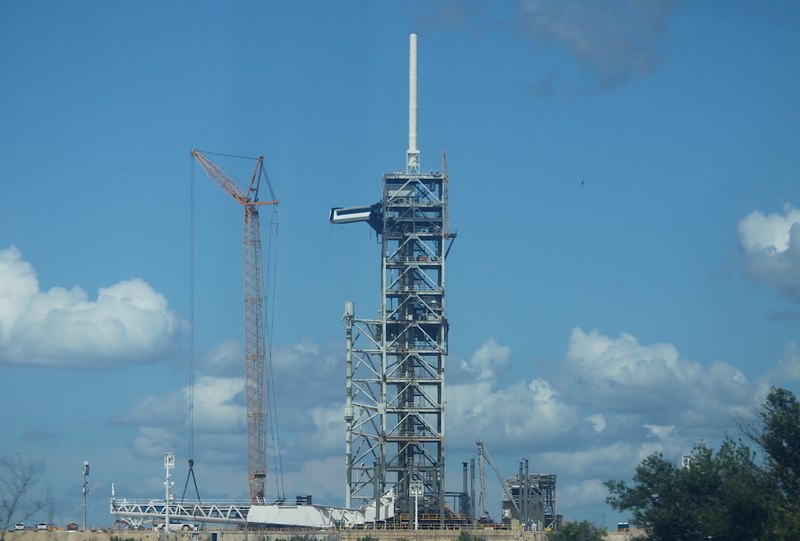 Once workers complete connections between the crew access arm and the pad 39A tower, SpaceX is expected to conduct testing to ensure the arm can properly retract and extend during launch countdowns. NASA and SpaceX plan to team up for five crew loading demonstrations aboard Falcon 9 Block 5 rockets — the same launcher configuration to by used by Crew Dragon missions — to certify a plan for astronauts to board the Falcon 9 rocket before fueling. The “load-and-go” fueling procedure employed during SpaceX countdowns involves filling of the Falcon 9 rocket with super-chilled, densified kerosene and liquid oxygen propellants beginning just 35 minutes prior to liftoff — after astronauts will already be strapped into their spacecraft on top of the booster. In contrast, ULA’s Atlas 5 rocket will be fueled before crews arrive at its launch pad to crawl into Boeing’s CST-100 Starliner spacecraft. And NASA’s space shuttle was fueled hours ahead of liftoff, before astronauts strapped in for the ride into space. NASA has approved the load-and-go fueling procedure — as reported by Spaceflight Now earlier this month — for commercial crew missions, pending a series of ground tests to verify the crew loading timeline before Falcon 9 launches. SpaceX argued the load-and-go proposal was less risky than fueling the rocket before astronauts arrive at the launch pad. In the event of a mishap on the launch pad during fueling, the Crew Dragon’s abort rockets will be armed to immediately fire the capsule and its occupants away from the pad. The load-and-go procedure would also ensure ground support teams are a safe distance away from the rocket during fueling. 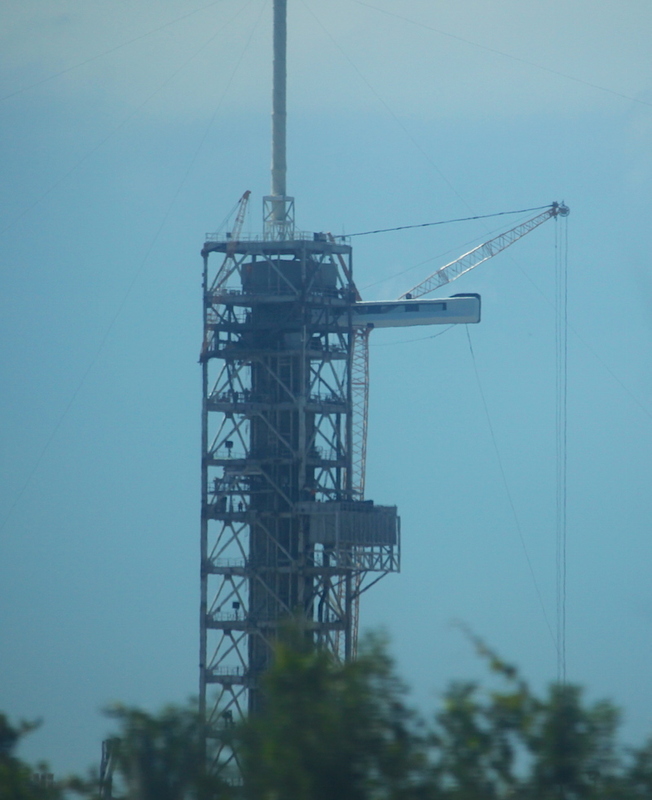 More photos of SpaceX’s crew access arm are posted below.